or click Contact Us below to organise a home delivery time slot. 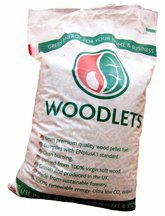 Buy Bagged Wood Pellets locally so you never run out!!! We deliver throughout Ayrshire and neighbouring counties. Assisted unloading/building in to store/garage. Please contact us for quote on multiple pallets. Huge savings to be had!! Save 3% on your first order from us when you use the code FirstOrder at point of purchase. T&C’s Apply. We are delighted to announce that we are “Biomass Suppliers List Approved” and we score very highly on for being a local supplier wood pellets supplier with a low emissions result.